I am a citizen of the Cherokee Nation, a member of the Cherokee Artists Association and I live on my family’s ranch near Tahlequah, Oklahoma. My passion is traditional pottery and 18th century clothing and beadwork. 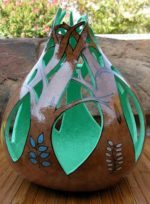 I have been making traditional pottery since 2005. I dig my own clay, clean and process it, build my pottery by hand coiling, and fire in a wood fire. I also do southeast appliqué Cherokee beadwork, using materials that were authentic as possible to the late 1700s-early 1800s. My heroes are those who have worked tirelessly to preserve and revive lost art forms and those who were brave and persistent enough to open the doors for the rest of us. They are the teachers, scholars, artists, writers, historians and warriors who have shared their knowledge with us and inspired a passion for the arts. My heroes are those who are smart enough to realize that battles are fought at many levels in many different ways.